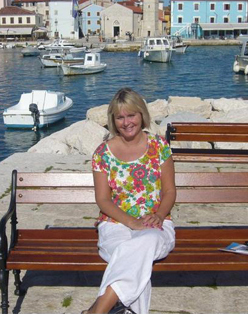 "I have always worked in travel, but I joined Premier Travel in 1996 - first as the manager of our Letchworth branch (since closed), then I moved to our Bishops Stortford branch as Senior Travel Consultant where I stayed for five years, and then finally I joined our Royston branch as a Senior Travel consultant, where I've been for eight years." Thailand , Hong Kong , Australia , Sri Lanka , Dubai , Oman , Brazil , California, Florida , the East Coast of Canada , Antigua, Barbados , Kenya , Egypt , Croatia , Cyprus , Various Greek Islands such as Corfu, Rhodes, Skiathos, Santorini and Crete , all of the Canary Islands , Austria , Sardinia , and various European resorts and cities such as Rome and Paris. "Sydney! – I have been fortunate to have visited three times and love it because it has all the benefits of a fantastic city – but with fabulous beaches close by, and if you travel North, unpopulated areas that have stunning scenery. Add to that no language barrier; a variety of great food, a fantastic climate… basically all I want in a holiday in one place!" "Visiting the Sydney Opera House for the first time; it's such an iconic monument. I think you have a vision of it in your mind, and when you actually see it in real life it's breath-taking. I couldn't believe I was actually there, after I'd imagined it for so long!" "I'm going to Mauritius in September on an educational visit; I'm very much looking forward to it as I haven't been to the Indian Ocean yet, we're going all over the island and I'm going to be taking part in lots of activities such as watersports and biking, which will be fun." "I would love to visit South Africa – I think it's a very diverse country, there's a lot to offer – great weather, food and wine, they are English speaking which is an added bonus, and it's one of the only places I haven't been yet..!" Don't leave purchasing your travel Insurance until the last minute! "I'm very experienced in travel, I've been to the majority of destinations we sell at Premier Travel and I feel that I can offer expert service from a first-hand perspective. I even received a bottle of champagne this morning from a satisfied customer!"